We were having a lovely sleep until we were rudely awakened by a speeding boat passing us at 6:30am. AmyJo lurched over alarmingly and came upright again. The fenders screeched against the armco and twang of rope could be heard as AmyJo strained at her mooring lines. By time I got out of bed the boat was disappearing into the fog that shrouded us. They must have come down the lock and been in a hurry to meet a deadline to be back at the hire base which I doubt they could make. It looked like one of the ABC Leisure boats from Wrenbury Mill. Their boats have been a real pain all week. Not one of them slowing down as they pass. Oblivious of the consequences of their actions they just smile and wave. One was going so fast he laughed as AmyJo lurched. He got a right mouthful from me and he looked very sheepish as he carried on. I'll be looking out for him down the line. The fog was masking the lock from view. By the time we got underway the sun had burnt off the fog and a clear bright morning resulted. Not as cold as yesterday the day warmed quicker and jumpers were not needed for the first time. A quiet run down to Frankton junction passing the occasional hire boat. No locking is allowed at weekends onto the Montgommery so no boats waiting there this time. A bit further on we came across these clumps of grass. They gave the impression of shaggy dogs drinking at the waters edge. We don't know what type of grass they are but there used to be a lot more of them as I recall from previous trips. We often see lots of boats with boater's gold piled all over the roofs but this chap clearly like things neat and tidy. I've never seen wood cut and stacked so neatly. 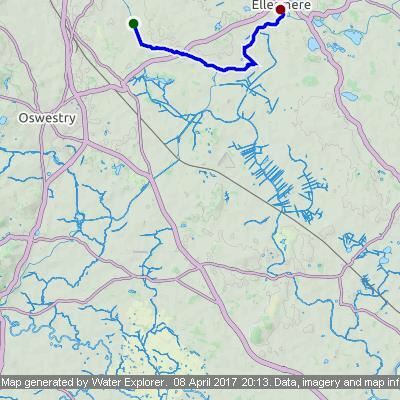 We pulled into the Ellesmere arm so Chris could do a quick shop at Tescos. Whilst there I rang the marina to ask if we could diesel up aware Saturdays are busy turn around days for their hire fleet and was told yes they could help. I expected to be told no but was asked to stop in the marina entrance which we did as there was no room to get fully in and onto to the fuelling jetty. No one could come in or out of the marina with AmyJo in the entrance. The staff were very accommodating and even helped when we reversed out of the marina entranced. In fact the chap filling our tank, in conversation, confirmed our suspicion and told us bookings for the hire fleet have indeed shot up as a result of the Carry on Barging program. All their boats were out last week and all were leaving today. Silly season is well on the way now on the Llangollen canal. 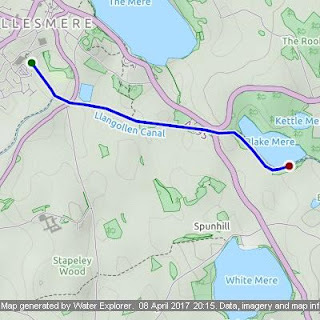 We took Smudge for a walk and found another nice mooring spot further on at Cole Mere so moved the mile downstream. Once settled on the new mooring we took a stroll around Cole mere and took a peek at the dinghies at the Cole Mere Sailing Club. Lime Kiln Cottage marks the start of a circular lake walk. When we got back to AmyJo we found an ABC hire boat aground opposite. He was trying to drive the boat forward to get unstuck. When he dropped the revs I called "try reversing off your only driving yourself further onto the obstruction". I got a very nasty look and a kurt "I know Mate". With my advise soundly rebuffed I said no more and sat watching the entertainment. Eventually after 20 minutes he finally decided to do what I suggested and got on his way yelling at his poor wife who had done her best with the pole on the bow. Seems it was her that put them aground in the first place. Having worn the three of us out we sat in the cratch with a drink watching the world speed by. Literally, every boat except one (all hire boats) passed at a rate of knots. The one that did not, interestingly, is the only one helmed by a young lady. (No I'm not going to start a sexist debate either!) I swear if this continues I will do the same in future. I know, that's not helping is it. I'll still slow and show them the correct way to pass.